"As a man thinketh in his heart, so is he,..."
The significance of the meaning of that phrase becomes crystal clear, if and when the inquirer has a sound interpretation of the meaning. Simply stated, the "heart", as stated, is not a reference to the organ that circulates blood throughout the body, but is rather, a symbol for what is nowadays more commonly referred to as the subconscious mind. One dictionary definition of the adjective "subconscious" may be taken as: "existing or operating in the mind beneath or beyond awareness of one's own existence, sensations, thoughts, surroundings, etc." This in itself may serve to aptly describe the mode of operation of the subconscious mind - specifically, that, even if we cannot observe or detect its operation via our objective or physical senses, it is working nonetheless; and one might add, it is perpetually working. That simple fact, in itself, is also of tremendous significance, when we realize the potentialities and properties of the subconscious mind. Now, because the Mind is itself a non-physical entity, it is debatable whether so-called "physical" science can determine with any accuracy the particular details of its powers, properties and qualities. Thus far, much is what is generally accepted as fact about how the Mind works, has been determined by philosophical and/or metaphysical reasoning. Notwithstanding, it has also been revealed that the phenomenon of hypnotism, particularly when treated as a serious subject, has actually substantiated many of the philosophical conclusions reached, regarding the subconscious mind. Before going further, it should be interjected here that, so far as the human personality is concerned, the subconscious mind, for the most part, exists and operates as the compliment to the conscious mind, thereby indicating the presence of two modes of activity within the human mind. 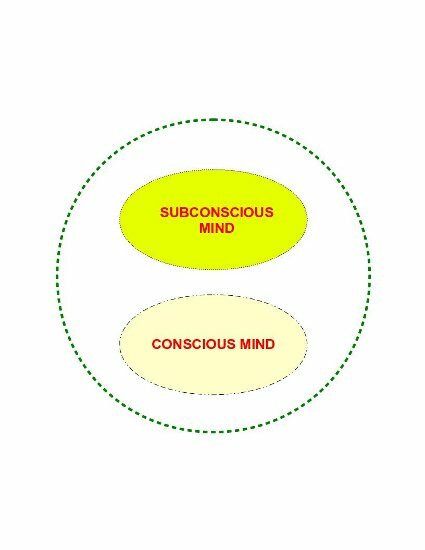 These two modes of activity are often referred to by differing terms: conscious and subconscious mind, objective and subjective mind, outer and inner mind, etc. In the opinion of this Author, any term can be applied to define these modes of activity, and each person is free to use the terminology which most clearly conveys the concept to them. But as we progress through this discussion, only a measure of passing reference shall be made to the conscious mind, in its role and function as the compliment to the subconscious mind, which is the primary object upon which this discourse is focused. In our time, much is documented regarding the powers, properties and qualities of the human mind, so that only a quick outline shall be inserted at this moment. The conscious, or objective mind, is generally agreed to constitute that part of the mentality which receives information via the physical senses, as well as where thoughts and ideas, so-to-say, take form - this is related to the process of Reasoning, which was previously outlined in the discussion of the Mental Faculties. This is important in itself, as it is also generally accepted that the thoughts or ideas established in the conscious mind are subsequently impressed upon the subconscious mind. By contrast, the subconscious mind may perceive and receive information independently of the operation of the physical senses. It is also agreed to be the storehouse of memory. It is the agency which directs and maintains all of the various functions and operations which go towards the continued working of the physical body - digestion of food, circulation of the blood, cell division, elimination of waste products, etc. It should be noted here briefly, and will likely be referred to again in another section, that the working of the subconscious mind regarding the working of the physical body, is in strict accordance with the thoughts and ideas - or perhaps more precisely, the Beliefs established therein, regarding the physical body. Philosophical and metaphysical reasoning has revealed that there may be considered two fundamental differences regarding the action of the subconscious mind, as compared to the action of the conscious mind. From the discussion on the Mental Faculties, it was mentioned that there actually exists two modes of the process of Reasoning - generally knows as Inductive Reasoning and Deductive Reasoning, respectively. Observations have revealed that the Subconscious Mind operates solely via Deductive Reasoning, while the Conscious Mind can operate via either mode. 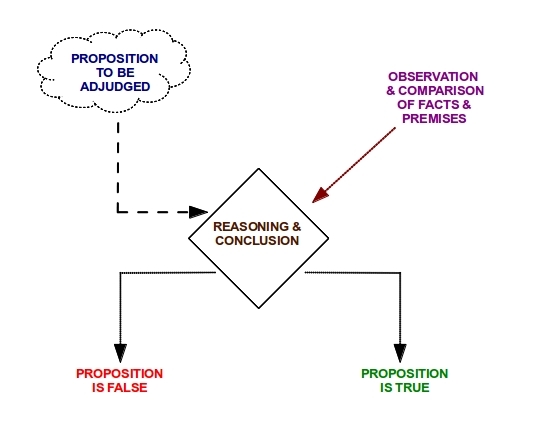 As the above diagram seeks to indicate, Inductive Reasoning involves observation and comparison of a number of facts concerning some particular proposition, after which, a conclusion is reached as to whether said proposition is true or false, and then the mind proceeds to work with that proposition, in accordance with the particular conclusion which has been reached. 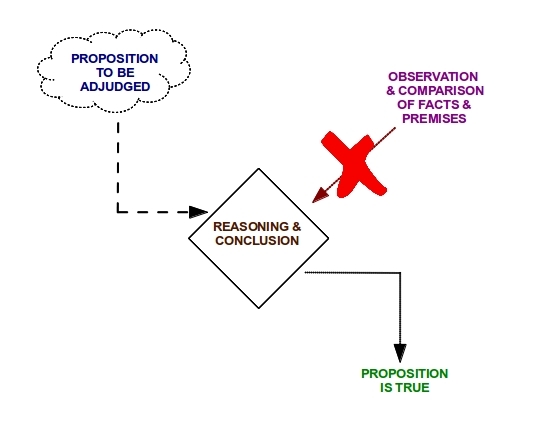 By contrast, and as indicated above, Deductive Reasoning does not involve any processes of observation or comparison, but simply assumes the proposition presented to it to be true, and then the mind proceeds to work with that proposition, on the basis of accepting it as being true. To paraphrase the words of a noted authority on the subject, countless experiments conducted on the phenomenon of hypnotism have substantiated the philosophical proposition, that the Subconscious Mind will accept any thought or idea impressed upon it, without question or reservation, and having once accepted that thought or idea, it will work out same to its logical consequences, down to the smallest detail, and those consequences are inevitably expressed as corresponding conditions in the objective or physical world, of the individual, in whose subconscious mind that thought or idea has been established. And a little consideration would reveal - clearly and unmistakingly - that the action of the subconscious mind, in working out any accepted idea (also known as a Belief) to its logical consequences, encompasses not only the working and operation of the individual's physical body, but even extends into - literally - each and every situation, circumstance, experience and event that constitutes the individual's objective world. One might even recall from the discussion on Mind Power, that Thinking has been determined to be a perpetual process, whether or not it is consciously directed towards some definite purpose - hence, each and every individual is impressing some thought or idea upon their subconscious mind - either consciously or unconsciously - and as a result, each of us is directing the Original Creative Power - call it Spirit, Universal Mind, GOD, or any other name - towards molding and shaping our objective environment as an exact correspondence to our Belief or Beliefs. This is of nigh-supreme significance, because our objective realizations - the conditions that are present in each person's objective world - are, except in very rare occasions, not the sole result of one particular belief, but rather, are the totality, or sum total, of all our established beliefs - in similar manner as in physical science, where a number of forces associated with some object can be resolved into a single resultant force. Now, if one were to apply the familiar "chicken-or-egg" inquiry to the conscious and subconscious mind, as to "which came first? ", something very remarkable would be revealed using one or more of the principles mentioned in previous discussions. The inquirer would do themself a favor to attempt to trace things out individually, but it can be proven through careful reasoning that the Original Creative Power, which for the moment we may call Universal Mind, can only be subjective or subconscious in its nature, and therefore, the same powers, properties and qualities that have been found to apply to the individual subconscious mind - its unquestioning acceptance of any thought or idea impressed upon it, and its exercise of creative power to work out any belief into corresponding conditions - must apply to it. 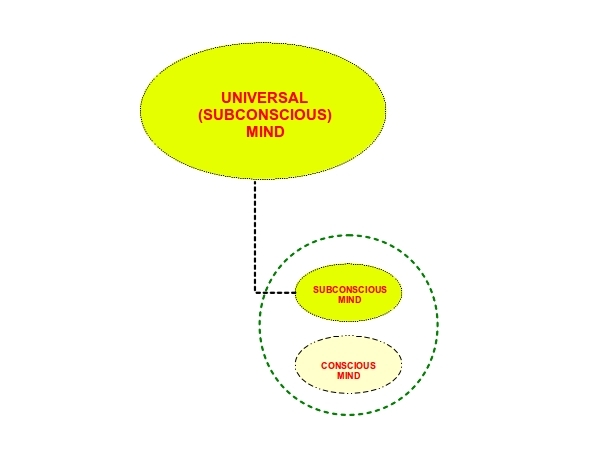 Accordingly, the Original Creative Power or Universal Mind may be more accurately described as Universal Subconscious Mind, and each individual subconscious mind may therefore be considered an individualization of the Universal Subconscious Mind, which corresponds to that proposition adapted from that familiar verse taken from the Old Testament of the Bible, that Man is "... made in the image and likeness of GOD". And the inquirer would do well to recall something else previously stated - namely, that the Universal (Subconscious) Mind exists - or rather, subsists - independently of Time and Space; as a result, Universal Mind, by itself, cannot engage in any sort of action upon that plane of existence that is governed by Time and Space, i.e., the objective universe. However, it can do so, albeit indirectly - by first becoming individualized, and then the individualized (subconscious) mind develops and forms its corresponding objective mentality (i.e., conscious mind). No doubt, there will be some who would ask the question: "How relevant is any of this towards the real world? ", which is indeed a fair question. There may be many different ways to respond, but for the moment, the following will be offered. The conventional approach with which the mass of mankind operate and have been conditioned to operate, is that the external or objective world is the only true reality with which they need to concern themselves. In contrast, it is perhaps slowly yet surely being revealed that the converse is proving itself to be true - that the internal or subjective world is the true reality, which is inevitably expressed in the outer world, which is one way to interpret that familiar phrase found in what is called The LORD's Prayer: "... on earth, as it is in heaven". If one would couple this revelation with the proposition that, as stated before, each and every individual mind is perpetually forming some belief, and impressing said belief upon the Universal Subconscious Mind, which in turn inevitably leads to the formation of corresponding conditions in the objective environment of the individual, then it becomes virtually impossible to over-emphasize the importance of gaining a clear and true understanding of the working of the subconscious mind. As also stated before, the working of the subconscious is perpetually going on, whether a person is aware of its operation or not, and more significantly, and so far as our knowledge on the subject goes, no person comes into the objective world "pre-programmed" with the knowledge of how to harness and wield the powers, properties and qualities associated with their subconscious minds. Thus, each and every person will sooner or later make one of two choices - either to let those powers run "where they will", without conscious control and direction, or to gain the requisite understanding, which will lead to conscious control and direction. Without exception, each and every person (Author included) will make a choice, and thereafter live and operate with the consequences of their choice. TYPE: The following web link is provided for that purpose (reference and further research) giving insight into the subject. Link opens in a new window. Napoleon Hill's take on the Subconscious Mind, excerpted from his book: "Think And Grow Rich"